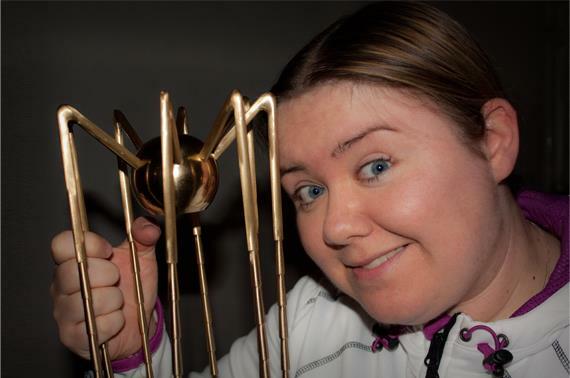 Castlebar - County Mayo - Sheena Oosten Scoops Spider Award. On Sunday night last the 2012 Eircom Spider Awards, dubbed the "Oscars of the Web Industry", were held in the Convention Centre in Dublin. The Spiders are an annual event which recognises and awards both Irish individuals and organisations for their outstanding achievements on the web and in the digital realm. The winning website, ChallengeTheGreenway.com was created to promote the annual Challenge the Greenway charity event and help the Cystic Fibrosis West team raise the much needed funds required to build a specialised day-care unit at Mayo General Hospital. Sheena Oosten with her Spider Award. Site designer Sheena Oosten said she was "delighted to be a part of the greenway team and to have played her part in terms of branding and design. To have been shortlisted alongside such high-profile nominees such as Trocaire was a delight in itself. But to have won the award was just amazing! I hope this recognition helps to further promote CF West and help them reach their goal of raising 1 million euro".